Undoubtedly, the events of September 11, 2001 served as a wake-up call to the scourge of global terrorism facing twenty-first century societies. But was the attack on the World Trade Center a crime or an act of war? Is seemingly indiscriminate violence inflicted on civilians ever morally justified? And should society's response always be in kind – with blind, destructive violence? For that matter, are all civilians truly ‘innocent’? The answers are not always so simple. 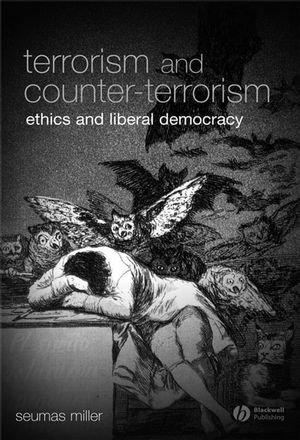 Terrorism and Counter-Terrorism: Ethics and Liberal Democracy provides sobering analyses of the nature of terrorism and the moral justification – or lack thereof – of terrorist actions and counter-terrorism measures in today's world. Utilizing a variety of thought-provoking philosophical arguments, the historic roots of terrorism and its contemporary incarnations are explored in depth. Detailed analyses of organizations such as the IRA, the ANC, Hamas and Al-Qaeda will reveal the many faces of terrorism and its disparate motives and tactics. Discussion of the nature and scope of terrorism and whether it can ever be morally justified is balanced with analysis of counter-terrorism strategies and the methods and moral limits of counter-terrorism. Terrorism and Counter-Terrorism will greatly broaden our understanding of the nature and morality of terrorism and counter-terrorist pursuits – a crucial precondition for establishing any form of enduring peace between nations in the twenty-first century world. Seumas Miller is Professor of Philosophy at Charles Sturt University and the Australian National University (joint position) and Director, Centre for Applied Philosophy and Public Ethics (an Australian Research Council funded Special Research Centre). He has published Police Ethics (2006), Corruption and Anti-Corruption with P. Roberts and E. Spence (2005) and Social Action (2001). 1. The Varieties of Terrorism. Terrorism and Counter-Terrorism in the Israeli–Palestinian Conflict. Terrorism and Counter-Terrorism and the IRA in Northern Ireland. The African National Congress’s Armed Struggle in Apartheid South Africa. Terrorism and Counter-Terrorism in India. The Definition of Terrorism in Terms of Innocents. The Definition of Terrorism in Terms of Non-Combatants. Terrorism, Combatants and Authoritarian States. The Definition of Terrorism: An Indirect Strategy. 3. Terrorism and Collective Responsibility. Moral Justification for the Use of Deadly Force. Civilian Immunity and Human Rights Violations. Civilian Immunity and Culpable Omissions. Terrorism and Non-Violent Rights Violators. Counter-Terrorism and Human Rights in Liberal Democracies at Peace. 5. Terrorism, War and States of Emergency. Terrorist Attacks, Disasters and States of Emergency. Terrorism, Internal Armed Struggles and Theatres of War. Targeted Killings and the Problem of Dirty Hands. What Is Wrong with Torture?. The Moral Justification for One-Off Acts of Torture in Emergencies. The Moral Justification for Legalized and Institutionalized Torture. 7. Bioterrorism and the Dual-Use Dilemma. Dual-Use Research: The Ethical Issues. Dissemination of Dual-Use Research Results. The Regulation of Dual-Use Research. Accessible and analytical, while offering practical solutions to ethical dilemmas posed by terrorism.